With a high-paying summer internship at a prominent labor law firm in hand, but not in heart, Alexander Grayson ’18 searched for an opportunity to combine two passions: legal advocacy and public health. He discovered AIDS Law Project of Pennsylvania, a nonprofit, public-interest law firm providing free legal assistance to people living with HIV and AIDS. From there, the philosophy major worked to secure a position and craft a LEEP Project. 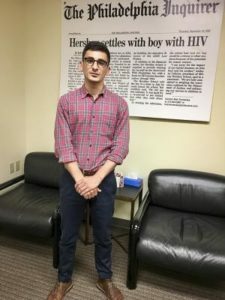 “I understood that interning in the same office as national leaders who secure civil rights and equitable access to justice for people living with HIV and AIDS was a rare opportunity that was worth forgoing a high summer salary,” he says. 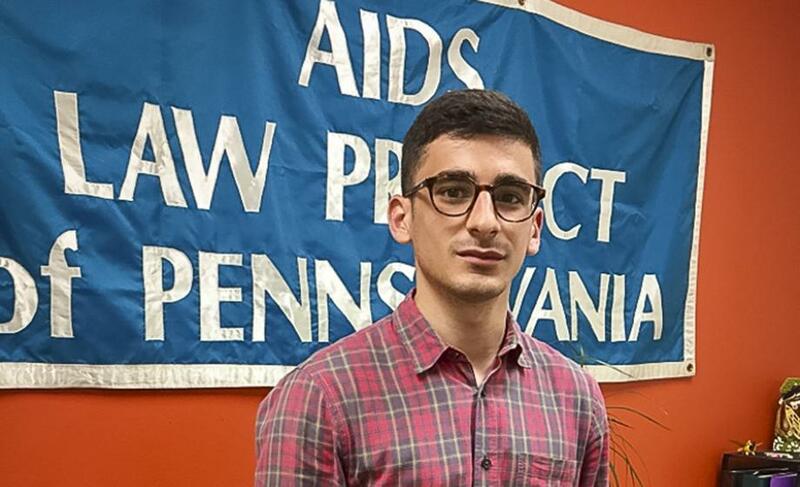 Alexander Grayson ’18 in the offices of AIDS Law Project of Pennsylvania. Grayson, who turned down a high-paying law internship to work at the firm, says he understood this was a rare opportunity worth forgoing a high summer salary. Grayson was disappointed when he learned the firm only offered summer internships to law students, but persisted and earned an interview by contacting an employee there, and sending his credentials along with a writing sample from Professor Deborah Merrill’s “Sociology of Health” course. He was offered an internship shortly after. At ALP, Grayson works with a team of lawyers and paralegals who advocate for their clients by combating HIV/AIDS-related discrimination. Some of the more prominent cases ALP has won include a 1994 decision against the City of Philadelphia when emergency medical technicians refused to treat HIV-positive patients, and a 2012 settlement with the Milton Hershey School when it refused admission to an HIV-positive honor student. “These successes fundamentally changed the way people living with HIV were treated under state laws and federal acts like the Americans with Disabilities Act,” Grayson says. Grayson presents client intake information at weekly meetings where the team discusses and assigns cases, and conducts quality assurance reviews to measure whether lawyers are effectively serving clients. In addition to discrimination cases, the firm handles HIV criminalization issues, housing, public and private benefits, immigration matters, consumer law and referrals. Grayson says while bigger cases receive the most attention, it’s the everyday work of the lawyers that most helps the firm’s clients. “ALP attorneys ensure their clients have a roof over their heads, the public benefits they’re entitled to and have an avenue to attain legal recourse for discrimination and harm that’s fundamentally rooted in the stigma of HIV/AIDS,” he says. To highlight ALP’s efforts, Grayson is conducting a social media campaign using the hashtag #JusticeUpdate, something he says is imperative given the vulnerability of clients in a changing political world. Grayson, who serves as a peer learning assistant for Professor Patrick Derr’s “AIDS to ZIKA: Ethics and Epidemics” first-year intensive course, says Clark has taught him the value of questioning the status quo, which complements ALP’s mission. After Clark, Grayson plans to keep fighting for the vulnerable by applying for a fellowship that advocates for access to justice and public health abroad. He plans to continue on to law school.